Wow. My husband definitely caught me off guard, which he likes to do. At first I didn’t know what to think. Now, after eighteen more years of powerful renditions of the “I Have a Dream” speech, I too have come to understand and respect even more all that Martin Luther King did to make a difference in our country. A few years ago my husband and I were in Washington, DC, and we took the time to visit the Lincoln Memorial. After reading the Gettysburg address inscribed in the walls of the memorial, we stood in the exact spot where Dr. King gave his renowned speech. It was powerful to be at the memorial of one of my favorite presidents, but add to that the opportunity to imagine what it might have been like for Dr. King to look out over a sea of people covering the mall, listening to his poignant words…well, it was amazing. I thought again about how much this man accomplished during his life, and what a difference he made. I think one of the things that impresses me the most about Dr. King is the fact that he believed strongly that one person could make a difference, and he was willing to devote his life to standing up for what he believed was right. As parents, I believe we can all make an effort to encourage our children to stand up for what they believe is right. I am concerned that many young people don’t have much drive and passion about things that really matter. I know there are many youth to whom this characterization doesn’t fit, but overall there is clearly room for our youth to improve. It is important to have passion. To have conviction. To be willing to make a stand. To make a difference. It is our responsibility to share stories of the great leaders like Dr. King, so our children can understand what standing up to make a difference looks like in our history. Today is a perfect day to start the conversation with our children about living a life that models the good things that Dr. Martin Luther King, Jr. stood for, and all he and other leaders before him and since did to make a difference in this world. Maybe our children will be inspired and carry that into their future, and their children’s future. Now, that would be a great thing. I recently had Mohs surgery to remove yet another basal cell carcinoma, a type of skin cancer. This one resulted in 8 stitches on the left side of my nose. The vain side of me is pretty upset that I now have a one-inch scar on the most prominent part of my face. The tiny, red spot appeared only a month or so before my annual skin exam, so that was the plus side. Since it was caught early, the size of the area removed is much smaller than it would have been a year from now. Unfortunately, I have had many of these skin cancers over the last 25 years. I grew up at the beach, and with fair skin, blue eyes, and reddish brown hair, I was a magnet for sunburns. I have had more than my fair share of them. Sunscreen wasn’t really a known product when I was a child, only tanning oils. I do remember my mom slathering a blob of zinc oxide on my nose as a young child on occasion, but only on occasion. I have many memories of using lots of Noxema, and sometimes vinegar to help stop the pain from the inevitable sunburns I would get after a day at the beach. After my first basal cell removal at age 20, I became more aware of protecting my skin. Since then, I use sunscreen and wear hats when I am outside for long periods of time. It was hard for me having grown up in an area where people regularly compare arms side-by-side to see who has the better tan. I have now lived in an area away from the beach for almost thirty years, so the pressure to have a tan is less than it was when I lived at the beach, but it still somewhat exists. I have decided that having healthier skin is more important than having temporary “color” in the warmer months. I know that the more I stay out of the sun, the fewer skin cancers I will have, and the lower my chances are of developing a melanoma, which can be life threatening. I understand that another benefit of staying out of the sun is that I will (hopefully) have fewer wrinkles when I am older– not a bad thing at all! When my skin cancers started surfacing, I went through a period of being upset that my parents didn’t do more to protect my skin. I was mad that they let me spend long days at the beach without regard for my skin and the burns that would result. It took me a while to realize that they honestly didn’t know any better. Once I knew better about the hazards of sun exposure, I made better choices. I now wear sunscreen every single day, and I wear hats when I am outside for a period of time. This is a good lesson for everyone, young and old– when you know better, you do better. Everyone makes mistakes. I know I have made many mistakes as a parent, but I hope that when I know better, I do better. I have tried to instill this lesson in my children since they were young, and hopefully they will do the same for their children. Now I am going to put on my sunscreen, my hat, and enjoy the rest of this beautiful day. Really, Where Did the Time Go? The new school year is in full swing. My daughter is now a middle schooler and my son is a high schooler. Both of them have entered their new realms with enthusiasm. They were ready for new challenges and eager to move on to the next level of their education and social development. Looking at them, I can’t believe they are already at this stage. In my mind, I can instantly be transported back to their infancy, toddler years, or early elementary days. Those days truly don’t seem that long ago. Where did the time go? Really, where did it go? I have never been a parent that wished for either of my children to hurry along a particular stage of childhood, no matter how difficult it may have seemed at the time. I have known many parents throughout the years to say how they couldn’t wait until their child got through the “terrible twos” or couldn’t wait until their child finally started school so they could have a life again. I am sure that deep down these parents weren’t wishing this time away, but merely wanting to get through a challenging period and on to one that wasn’t as taxing from a parenting standpoint. I remember when my son was a baby, many friends and acquaintances would tell me to treasure each day because the years go by so fast. “In a blink of an eye, he will be going to college,” they would say. Of course, at the time I could hardly imagine that happening. I also felt a little annoyed each time I heard that, thinking these parents were exaggerating and had it wrong . I was immersed in the world of diapers, no sleep, and adjusting to my new role as mom. Now, as I begin the new phase of parenting a middle and high schooler, I realize these parents are right. I can see the time of being an empty nester right around the corner. I know many friends and family members that have now joined the empty nester community. Some have handled the transition well, and others have had a difficult time. If parenting during the teenage years were particularly challenging, this time can be a welcomed change. I have heard some people say that God made teenagers with all their challenging ways and ideas to help prepare parents for the time when they leave the nest. Even though I am only in the early stages of the teenage years, I can see how that is true. I admit, I cried like a baby when my son “graduated” from middle school. He had been at his school for twelve years (he started as a toddler at a Montessori school), and it was hard to imagine him not being there any longer. I can only imagine how hard it will be for me when he graduates from high school. My children (and husband) already tease me about how much of a mess I will be when that day arrives. So, bets are on that I will be in the camp of having a harder time when my “baby” leaves the nest. Author Gretchen Rubin has a wonderful 2 minute video on her website (www.happiness-project.com) that captures the essence of my sentiments. I really love her books and all that she shares with the world. Check out the video, but make sure you have a tissue or two in hand– http://theyearsareshort.com. After watching, I am sure you will definitely understand what I am feeling (if you didn’t already) and possibly shift your perspective and attitude towards parenting. Hold on and cherish each moment. It is such a short time. -Freckles, the main character in my books, now has a Facebook page! I invite you to check it out– http://www.facebook.com/funwithfreckles. 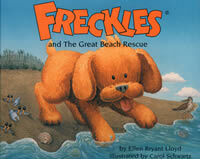 Also, FRECKLES and The Great Beach Rescue will soon be available as an eBook! I am so excited! I will keep everyone posted! I have decided that there is a good chance bullies in grade school grow up to be bullies as adults if not redirected early in life. I recently had a maddening encounter with a grown-up bully. I was at an intersection, stopped about 5 cars back from a red light. To my right was a small cross street. Cars at this cross street usually wait until the light at the larger intersection turns green and the traffic clears before safely exiting onto the busier road. Well, apparently the driver of a brand new Lexus sedan didn’t like that plan. HONK! HONK HONK HONK!! HONK HONK HONK HONK!!! The series of urgent honks from the car got my attention, and I immediately thought something was wrong or he was in trouble. This was so not the case. I observed a man in his late-50s urgently motioning for me to back up, in between his fervent honks. It took me a moment for my brain to register that he actually wanted me to reverse my car so he could cross in front of me and turn left. Glancing into my rearview mirror I saw two cars closing in on my bumper. I knew that if I backed up there was a good chance the car immediately behind me would hit me. I looked at the man, who continued to honk and motion, and held my hands up, then pointed behind me to the approaching cars. This was obviously not the response he was looking for from me, because suddenly the gray-headed bully came barreling towards me, clearly determined to make his way into the road and force me to back up. I couldn’t believe what was happening. In that moment, I realized the car was going to hit me if I didn’t move back. My instant reaction was to quickly move into reverse as his car wasn’t slowing down. I braced myself for impact from either the front or rear. The shocking thing was that this bully apparently decided he had no regard for my situation and selfishly wanted to move through. I backed up at exactly the same time he literally came whizzing by, barely missing my car. As he moved past me, I looked directly into his eyes and met the face of an angry person. He glared back at me as though I had done something wrong. The nerve of that man. Thankfully the car behind me was paying attention and slammed on brakes, avoiding my car. I had to pull into a nearby parking lot to compose myself. It was difficult to process how someone could be so obnoxious. So much a bully. It would have been different if he approached it differently, if he had sincerely been in a hurry for some urgent reason. I didn’t detect any remorse or emotion that would lead me to believe he had anything going on other than a mean spirit and a bullying energy. Later in the day, I thought about this incident again. It struck me that there was a good chance this gray-headed bully started his bullying behavior at a much younger age. I thought back to other bullies I had known in grade school, as well as those I have observed in schools and other environments with children. I know of several, and hope many more, that eventually chose a better path as they matured. I know, sadly, this isn’t the case for all young bullies. I think it is important to teach our children about bullying behavior at a young age, and continue with this discussion all through adolescence. Not only is it important for children to recognize when they or people around them are being bullied, but to also recognize if they are, at all, exhibiting bullying behavior. Nobody wants to believe that “their child” could possibly be a bully, but it happens. It is the responsible, aware parent that accepts that their child isn’t perfect, and is willing to address it head on in a positive, constructive manner. Turning a blind eye or making statements like, “boys will be boys” or “girls can just be like that” are poor excuses, in my opinion, for not making the effort to be an effective parent. There are way too many stories in the news of the horrible affects of bullying. It must be stopped, the earlier the better. Our house was struck by lightning this week. A typical summer thunderstorm popped up one afternoon, only this one seemed unusually strong. In literally a flash, many things in our house were changed, and not for the better. Initially, the strike appeared to have only hit the AV equipment in our media room. My husband saw an arch of light shoot from the cable box, followed by sparks and smoke emitting from all the speakers. To say it was a little scary is an understatement. A visit from the fire department assured us that no immediate fire/issues remained in the walls, but they recommended an electrician thoroughly check our entire system to assess all the damage. Upon further exploration, we discovered that the lightning actually affected many other things in our house… both cable boxes (the one downstairs as well), alarm system, wireless router booster, landscape lighting, all our phones, the phone box, a phone jack, and two sofas (they have motors so they can recline). This is all on top of the real possibility that our main television and all the stereo components are ruined. I feel sure other things we aren’t even aware of were affected as well. This experience brought to mind the phrase things can change in an instant. This holds true for many things. A tragedy, death, award, diagnosis, winning the lottery, natural disaster, book contract, or invitation are a few examples of things that can all alter the course of our lives forever. It is our reaction to these events that determine whether the course has a positive or negative impact on our lives. While some events cause immediate pain or hurt, I have always wanted to believe that there is a silver lining. Sometime that lining is challenging to find or takes its time to surface, but I honestly believe that it does always exist. Although this event impacted our lives to a degree, it was minor in the big picture. It did, however, make me think about others that aren’t as fortunate in similar situations. I do believe there is even a silver lining in our story, although I haven’t quite figured it out yet. On a superficial level, the silver lining might be an opportunity to get a new television and stereo equipment, or that our new cable boxes have more DVR storage. I do know that I was very thankful we were home when it happened so we could disconnect the power and prevent further damage. I am also thankful we live close to a fire station that responded quickly and was thorough in making sure all was safe in our home. But most of all, I realized that the situation could have been much worse, and I was thankful that my little family of four was safe, minus a few frazzled nerves. On second thought, that is the silver lining and what really matters. Fall is my favorite time of year. I love the cool, crisp days and the beautiful color that takes over the trees. I particularly love the bright orange leaves of the Maple tree. One tree in my neighborhood caught my attention this year. As I noticed the leaves starting to change on a few trees, I saw that this tree only had a few leaves that had changed. I glanced up at this same tree each day as I traveled in and out of my neighborhood. Every few days, I saw that a few additional leaves had turned to a beautiful orange, slowly covering the tree with color. Over the course of several weeks, the most vibrant color of orange completely emblazoned this tree. I thought to myself how this tree and the time it took to change color was a metaphor for children. One day you start noticing small changes in their maturity or the way they approach or handle a situation. You might also notice a few small changes in their appearance and voice. Little by little, they grow and change. Most of these changes aren’t apparent on a daily basis. Then, one day you wake up and realize that your children have grown and matured, and are taking on a whole new sense of self. It is as if you can more clearly begin to see the adult they are becoming. The hard part for parents, especially this one, is releasing the image of the little child and embracing the maturing adolescent. Children do grow up so fast, and with that comes the inevitable steps of gradually letting go and allowing them to blossom into the people they are meant to be. As they grow up, they don’t need us as much, at least not in the same way. They don’t need us to bathe them, feed them, and get them dressed. They can keep track of their school work and help around the house. What they need more now is a mentor, guide, and example for how to be a responsible adult. Now, as I wipe away a few tears, it is time to embrace this new stage of parenthood and enjoy the scenery as the leaves continue to change. I know that one day I will look up, full of pride, and see that my trees have completely changed and are incredibly gorgeous and completely full of vibrant color. One of the things I love about being a children’s book author is that I have the honor of meeting and speaking to children at schools. I enjoy interacting with children, sharing information about my life as an author, writing books, and publishing books. Part of my presentation, naturally, includes tidbits about my family. Much to my children’s chagrin, my presentations generally include several photos of them along with a few humorous stories. I always ask the students to never mention that they heard any stories about my children if they ever meet them. I usually get a few chuckles from this request, and lots of “we promise” statements from the audience. The truth is, my children are well aware of the stories and photos. They aren’t thrilled about this fact, but they know it comes with the territory. This promise was recently put to the test. My daughter’s eyes darted up to me and glared, then moved back to the eye-lock with the young girl. “Why, yes it is,” I said. “What grade is she in?” she asked, still looking into my daughter’s eyes. My daughter just stared, not saying a word. “She is in the fourth grade. What grade are you in?” I replied. “Fourth.” Oh, no. Same age. Not good. My daughter didn’t say anything about this interaction until we were in the parking lot. Then she said, “You know, stuff like that is happening more and more, Mom. I guess that is just the way it is going to be the more famous you get.” First, I was relieved that she wasn’t mad, then touched that she paid me such a sweet compliment. I love what I do, am passionate about great books for children, and feel honored to be part of the incredible world of creating books for children. Now to have my daughter add a little stamp of approval… it doesn’t get any better!